MAGERE – Kyadondo East Member of Parliament Robert Kyagulanyi aka Bobi Wine has urged President Museveni to save his legacy by ending the brutality of those opposed to his government. 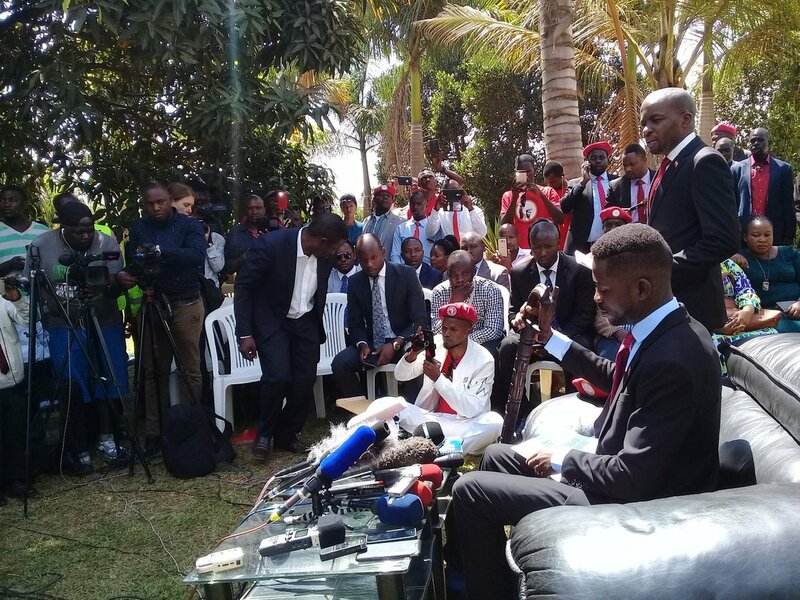 Addressing a press conference at his home in Magere, Kyadondo, Wakiso District on Monday morning, Bobi Wine said the actions of the state in the Arua chaos and the aftermath show that the current government thrives on torture. “What happened on the 13th of August in Arua, opened the eyes of not only Ugandans but also the peace-loving people across the globe to the reality that we are dealing with every day,” he said. “I am still trying to come to terms with the death of my friend Yasin Kawuma. Many people were brutalized and I managed to visit some that I could reach. Many have been detained without charge,” he added. The MP also criticized President Museveni for backing his soldiers whom he said brutalized MPs and civilians during the Arua chaos. “What does it feel when you treat your people like this Mr President? How does it feel having your boots on the necks of your people? That was very disappointing very, very disappointing,” Bobi Wine said. “Grandparents are people that we run to for protection, for love, and for care. Just yesterday when my grandmother visited me… she carried me on her lap; she is very old and weak but she patted me and hugged and prayed with me. She tried to carry me yet she can’t. Mr President, I think that that is how grandparents should treat their grandchildren. They shouldn’t be brutalizing and framing them every time they have a different opinion. We want to learn from you Mr President,” he added. The MP also accused government of deliberately demonizing the concept of People Power by calling all who pronounce it terrorists. “We have been subjected to ridicule, and reduced to less than citizens, so we decided to invoke Article 1 of our constitution, which is the first step to realize who we are. People Power is not about myself as Bobi Wine but an idea that is premised on the fact that power belongs to the people. Not some power but all power,” the legislator said four days after arriving in the country following his brief visit to the US for specialized treatment. Bobi Wine also urged the security agencies to exercise restraint, saying the demonstrators are against Museveni’s dictatorship. He also revealed that his lawyers will take on the security forces for torturing Ugandans.